Read Ambs' blog for tips, tricks, and inside information from answering service veterans on how to create a culture of professional, customer-focused voices. Is an answering service right for your organization? 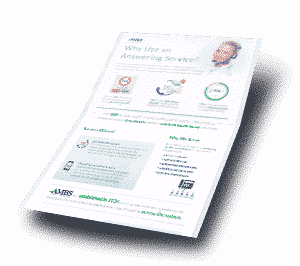 Get our free infographic, illustrating how partnering with an answering service can grow your business, by subscribing to our blog. Don is the proud owner of a small business. He puts his heart and soul into managing his business and making his customers happy. He starts his days as early as possible to get a head start on the day; and he works late into the evening to plan for the next day and answer his customers’ after hours phone calls. Don “burns the candle at both ends,” and it’s starting to take its toll. His life as a business owner is starting to spiral out of control. His days seem to drag on, and his nights seem even longer. Using a virtual phone receptionist is a great way to impress your callers. On top of that it helps you take control of your calendar and focus on the things that matter. Here are 12 reasons why using a virtual answering service will help your business. Doctors answering services have been around for a long time. But that doesn’t mean they’re obsolete. In fact, they may be more important now than ever before. Throughout this time the medical answering service has continued to evolve to meet healthcare providers’ needs and their patients’ expectations. With an emphasis on the personal touch, a patient answering service applies the latest technology to their service offerings so they can provide best-in-class service to their healthcare clients. An answering service is a professional services provider that can make a difference in how your organization communicates with your stakeholders. If you view an answering service as a commodity solution, you misunderstand their true value, and you’ll likely end up selecting the wrong provider for the wrong reasons.